This church is located in Fort Riley Kansas. It is known as building #13 otherwise noted as the Post Chapel. There is a smaller chapel, which sits to the west of the Post Chapel. 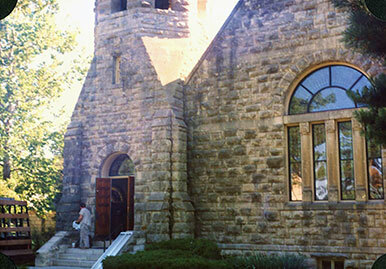 It is known to be the oldest surviving chapel west of the Mississippi. Quarried out of Kansas Limestone, cut and dressed beautifully, both structures were constructed by some of the finest masons and craftsmen of their day. The interior woodwork has been maintained as with all the plasterwork. All being said, it was an honor working on a church that has been so carefully preserved for all those years. The first part of the restoration project was to remove the exterior glazing, olde sash frames, and stained glass windows and replace them with bronze anodized aluminum frames. The bronze color matched the olde original paint on the sash frames. There was some wood rot which had occurred on the northern window, outside of that instance, the other sills had been painted and well maintained and showed no signs of any water damage. After installing the aluminum frames the new safety glazing was installed. Once the church had been secure from the elements the restoration of the stained glass windows could commence. 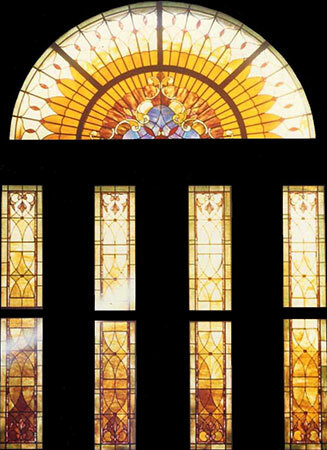 There were three of these arched leaded windows, one was located in the foyer, the other two over the front and rear doorways. All three were matching in design, color, and texture. The glass was most probably Olde Mississippi Art Glass. The lead caimes were removed and they were re-leaded with matching restoration lead supplied by DHD Metals. The wooden sash frames, which held the stained glass windows, were refinished. The interior surface had three coats of varnish applied, and the exterior surface had two coats of primer and two coats of paint applied. The exterior painted surface matched the bronze finish of the aluminum frames. This arched window and the four lancelets below, faced a Southerly exposure. The glasses were rich in light brown and amber tones. Subtle hues of teal and cobalt blue were found in the central section of the arched window. These glasses were also from Olde Mississippi Art Glass. Their texture was a very small ripple which at the time was unavailable from any contemporary glass manufactures. Kokomo Opalescent now makes a glass texture called Vertigo which nails that texture right on the mark. It sure would have been nice to have that texture at the time that this restoration took place. All the broken glass, which had the tight ripple texture, had to have a small mould made with the reverse of the ripple pattern. The new glass was placed on top of the mould, in a kiln, and the texture was transferred onto the back of the new glass during the firing process. With a Northern exposure, no trees or buildings to block the view, this was an easy restoration. Except for the fact that the stained glass window was missing, I had a clear view as to what was ahead of me. 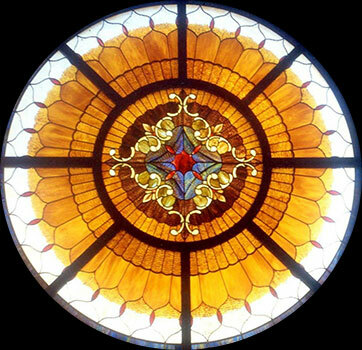 The opening was eight feet in diameter and the original glass artist, eighty years prior, installed one large window without the use of tracery. It seems that a Kansas wind storm ended the windows short lived history. After collaborating with the Kansas State Historical Society, an olde photograph was found and the design phase could begin. Both the Southern arched window and the Northern circular window had no tracery elements. It was agreed upon by the post engineer and post architect that anodized aluminum frames were the best choice. The tracery is the circular and spoke outline which supports the nine individual pieces of stained glass. This tracery can handle much greater wind loads than a single piece of stained glass. There was about 25 square feet of stained glass taking the wind loads before it met its’ ultimate demise. Having the arch window to use for the color pallet, and the artwork supplied by the Historical society, I was able to fabricate a new window which replicated the original in design, color, and texture. The folks over at Kokomo Opalescent were of the greatest help in matching the olde glasses. Redfield’s received an accommodation letter from the Post engineer commending us for our safety parameters and making sure the work site was always free from debris.